Oops! We can´t change the country of destination with the empty cart. Please add some product to the cart and try again. COFFEE, CHOCOLATE POWDER & TEA! 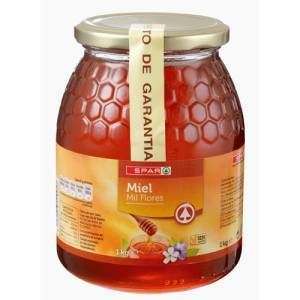 The best honey, collected from all the flowers, is contained in this glass container. APRICOT JAM "LA VIEJA FÁBRICA"
PLUM JAM "LA VIEJA FÁBRICA"
TOMATO JAM "LA VIEJA FÁBRICA"
BLUEBERRY JAM "LA VIEJA FÁBRICA"
DIET BITTER ORANGE MARMALADE "HERO"
PEACH OF THE SEASON ZERO JAM "HERO"
FIG JAM LA ALPUJARRA "LA MURTEÑA"
TROPICAL PAPAYA JAM "LA ALPUJARRA"
HOMEMADE PAPAYA JAM "EL MIRTO"
FIG JAM "VENTA DEL CHALECO"
MANGO JAM "VENTA DEL CHALECO"
PAPAYA JAM "VENTA DEL CHALECO"
RIPE TOMATO JAM "VENTA DEL CHALECO"
GRAPE MUST WITH PUMPKIN "EL MOSQUI"